Myanmar’s President Thein Sein, who has overseen the country’s shift from global isolation to integration, confirmed that he will not be seeking a second term in the upcoming 2015 elections. He has been president of Myanmar since 2011. The decision casts some uncertainty on Myanmar’s future leadership and may open its political field to competition between democrats such as Nobel Laureate Aung San Suu Kyi and reactionary groups sympathetic to the military junta. 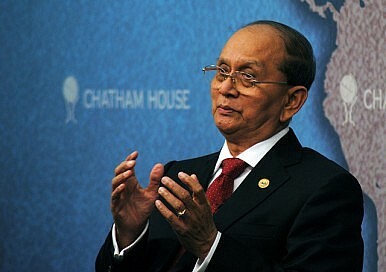 Thein Sein’s tenure as president resulted in an unprecedented trend towards liberalization in Myanmar. He was praised for his economic policies, and peace efforts with indigenous minority rebels. He had previously gone on-record as starting that his decision to return for a second term would be influenced by his physical health and popular demand for his rule. Thein Sein also radically transformed Myanmar’s foreign relations, forging closer relations with almost all of the country’s neighboring states, as well as distant powers. His visit to the United States earlier this year was the first visit of a Head of State from Myanmar in 47 years. He has simultaneously courted both India and China in economic matters. China’s perception in Myanmar has suffered as a result of its economic practices, and in light of its domestic reform. Consequently, it has revamped its efforts to restore positive relations. India, in the meantime, has grown closer to Myanmar. As The Diplomat recently noted, India has sold Myanmar defense technology and continues to engage Myanmar economically. China sees Myanmar as a strategically crucial access-point to the Bay of Bengal, and India sees it as the first node in its ever-enduring Look East Policy. Myanmar also reached an important milestone in its ASEAN membership when it assumed the chairmanship of the regional organization this month. Considering the momentum generated by reform, and its position between India and China, Myanmar’s next president will face a tall order in continuing the country down its current path while maintaining face across Asia. There is no shortage of challenges for Myanmar as it continues its path to development and global integration, and it will require a visionary leader to carry the country forward. Thein Sein, upon accepting the ASEAN chairmanship, said that "At [this] time, our citizens and the entire world are watching closely on us.” The same will be true in 2015. Myanmar's military took a bashing in the polls on November 8, but it will continue to play a role in politics.